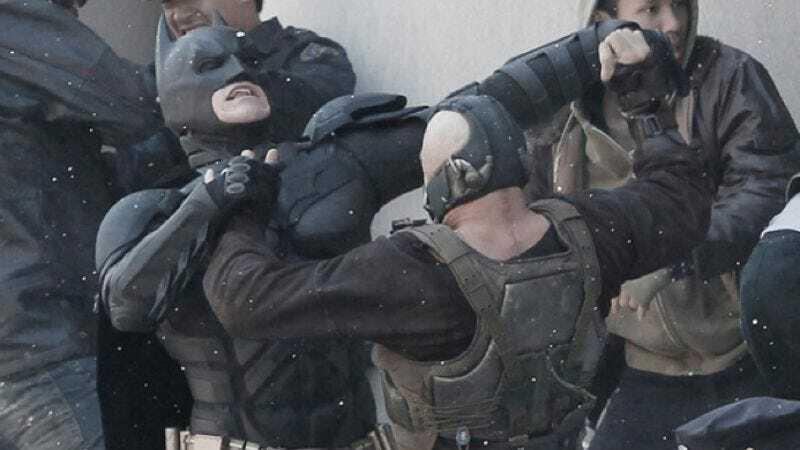 Thus far details on The Dark Knight Rises have been limited to pure speculation, based on leaked set photos, intentionally shrouded character descriptions, and the usual Internet rumor-mongering. But via an interview with Empire, director Christopher Nolan and star Tom Hardy have opened up and provided some actual details—details that are just vague enough to keep that speculation going for a few more months, but which probably count as spoilers for anyone with a hair-trigger for that sort of thing, so be advised. While remaining typically guarded, Nolan did reveal that the film won’t be an immediate continuation of the last film: “Perhaps surprisingly for some people, our story picks up quite a bit later, eight years after The Dark Knight,” he says. “So he's an older Bruce Wayne; he's not in a great state.” Hardy was slightly more direct about playing Bane, saying, “He's brutal. Brutal. He's a big dude who's incredibly clinical, in the fact that he has a result-based and oriented fighting style. It's not about fighting. It's about carnage. The style is heavy-handed, heavy-footed. It's nasty. Anything from small-joint manipulation to crushing skulls, crushing rib cages, stamping on shins and knees and necks and collarbones and snapping heads off and tearing his fists through chests, ripping out spinal columns. He is a terrorist in mentality as well as brutal action.” Or, judging by the below cover image of Batman wielding a light box, maybe Bane just suffers from a particularly nasty case of seasonal affective disorder.